Have you been to a swimming pool lately? When you start learning about swimming it may be that you will go down the steps carefully to reach the bottom, or use the ladder from the side of the pool. Here's a picture of a set of steps and the ladder. You'll probably notice that I've coloured the steps. The first step into the water is light green, the second step is purple, the third red and so on. The same is true of the ladder. Later, I'll be thinking about numbering these coloured steps. 1. Suppose your friend puts you on step $4$ and you only want to go a little way into the water so you head for the red step. Stepping down carefully, one step at a time, how many steps will you have to take? 2. Now the next time you want to go into the water your friend takes you to step $2$ and you're going to step down carefully to the blue step at the bottom. How many steps down do you have to take? 3. When you have finished swimming you take yourself to the yellow step and meet your friend on step $5$. How many steps, one at a time, do you have to take? Maybe it's time to number these coloured steps. I think I'll go for numbering them down from the water surface. 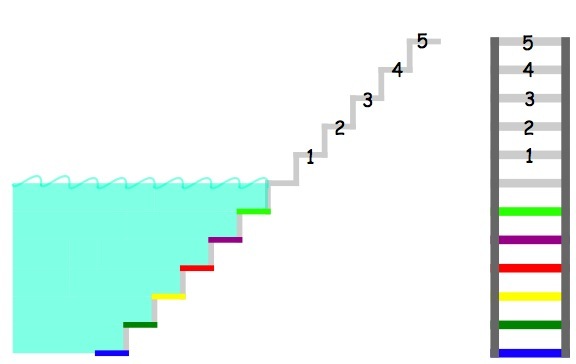 Can you invent your own way of numbering the steps which go under the water? When you've numbered your steps in some way perhaps you'd like to send in the pictures? Addition & subtraction. Games. Positive-negative numbers. Number - generally. Counting. Visualising. Combinatorics. Investigations. Place value. Working systematically.